Stormwater is urban runoff water that has picked up pollutants as it flows through the storm drain system–a network of channels, gutters and pipes that collect runoff from city streets, neighborhoods, farms, construction sites and parking lots–and empties directly into local waterways. 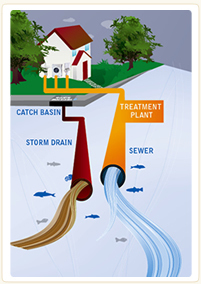 Unlike sewage, which goes to treatment plants to remove toxins, urban runoff flows untreated through the storm drain system and directly into our local water bodies. Anything thrown, swept or poured into the street, gutter or a catch basin–the curbside openings that lead into the storm drain system–can flow into our channels, rivers and eventually to the ocean. The beauty of pollution prevention is that everyone in San Bernardino County plays a part in keeping our area clean and safe. Simple steps in everyday life are all it takes to do you part. Figure out which category you fit into and get involved!